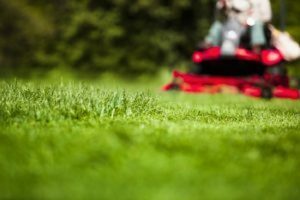 Surprisingly, the sound of a lawn mower can cause hearing loss if you are exposed to it for too long! Summer is right around the corner and that it means it’s time for backyard BBQs, outdoor festivals, and more! The warm weather comes with a lot of fun, but can also be hazardous to our hearing. With so many different sights and sounds outside, you probably don’t even realize that some may be affecting your hearing. Here are some common summer sounds that can cause hearing loss. A fireworks display is pure entertainment and is fun for the entire family. However, the sound of fireworks exploding in the sky can actually be harmful to your hearing. Each boom from the fireworks is about 150 decibels of noise. To put that into perspective, 85 decibels or higher is the amount that can cause hearing loss. To protect your hearing, be sure to stand far away from the area where people are actually setting off the fireworks. Summer concerts are so much fun and a great way to get out and listen to some great music. It is known, however, that the sound systems used for these events get very loud. The amount of damage that can be done varies depending on how close you are to the speakers themselves, but concerts can reach about 115 decibels of noise and for a prolonged period of time. Ear plugs are a great way to protect your hearing at a concert, while also still allowing you to enjoy the tunes. This one might come as a surprise to some, but everyday machines that you hear outside of your home can actually impact your hearing. In a busy neighborhood, you are almost guaranteed to wake up on a summer morning and hear the sound of a lawn mower or construction tools outside of your window. These machines can actually produce 100 decibels or more of sound and for an extended period of time. If you are the one operating the machinery, be sure to invest in ear plugs. Summer is a great time to go to that baseball game or NASCAR race you’ve always wanted to see! Sporting events are a lot of fun, but they also come with a bunch of different noises. The crowds are cheering, announcers are talking, and the sports themselves have their own noise as well. Things like race cars can actually produce up to 115 decibels of noise with each roar of the engine! As mentioned before, ear plugs are a great way to minimize the amount of noise that actually penetrates your ears, while not taking away any of the fun. This entry was posted on Friday, June 8th, 2018 at 10:42 am. Both comments and pings are currently closed.